The Management of the Federal College of Education (Special), Oyo has released the list of candidates offered provisional admission into its NCE programmes for the 2018/2019 academic session. 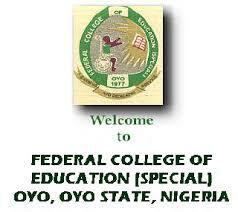 Check Federal College of Education (Special) Oyo Admission List. Go to https://nceportal.fcesoyo.edu.ng/(S(k3gsayo3guk2g1upncsrqcgy))/UTMEAdmissionList.aspxto check your FCE (Special) admission status for the 2018/2019 academic session. Successfully admitted? Go to JAMB CAPS portal to ACCEPT or REJECT the admission offer – How to Reject/Accept Your Admission on JAMB CAPS. Your name may not appear on the list below if you (1). fail to effect change of institution and pick the college as first choice on JAMB Website. (2). fail to upload WAEC/NECO/NABTEB results into jamb website via your personal JAMB Account. For further information call 07037915680 or 08050920222. Congratulations to all the candidates that made it to Federal College of Education (Special), Oyo admission list.